2 Troll face molds. Poppy & Guy Diamond. Fondant or gumpaste only for these molds. 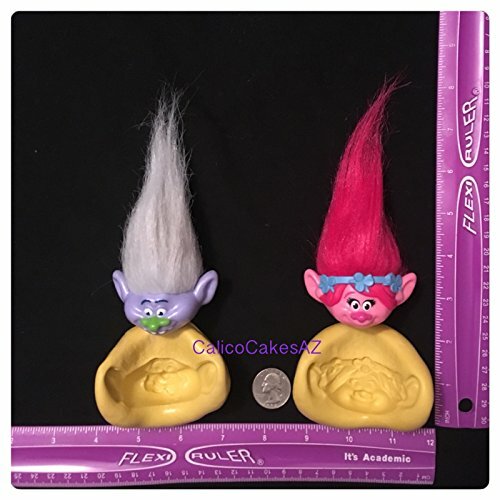 They are curved, and anything liquid will not stay in Each mold will have a slighly indented area above the eyes for the hair, it is a very LIGHT indent, accent with edible marker or edible paint. • Handmade item • Material: Silicone mold • Made to order ALL molds are FOOD SAFE! Non Toxic Complies with FDA 21 CFR 177 2600 Food Use for Molds: Fondant, gumpaste. All molds are made by me when you order. I make my molds thick, so they hold up better for repeated use,. If you are using this for food, use it ONLY for food. Can be used in the oven UP TO 300 Degrees Fahrenheit. Hand wash with soap and water and allow to fully dry before use. Do not eat. The molds are very flexible, no need to use a releasing agent, just bend, and your creation will come out. Please note: Most molds will be yellow in color, but some may be purple. Thank you. Please note: Once your item has been handed over to the USPS for shipping, it is out of my hands. I cannot guarantee a delivery date. Your order will be updated with tracking info once shipped. Refunds only if the item is defective. NOT for misuse of mold. Do NOT use sharp tools with the molds. If you have any questions about this product by CalicoCakesAZMolds, contact us by completing and submitting the form below. If you are looking for a specif part number, please include it with your message.